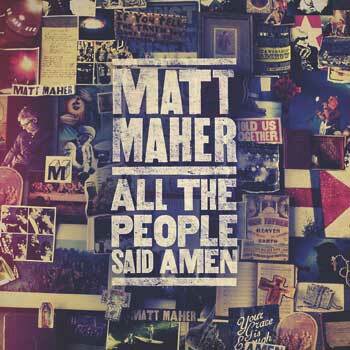 Enjoy a musical collage of Matt Maher's most popular songs! Reflecting on the past ten years, Matt Maher sees his music—and the Church—as a collage: different expressions from different areas of life, held together by the Gospel. Featuring four newly released songs and live versions of nine favorites, All the People Said Amen strives to remind us that, as God's handiwork, we're all part of a larger work of art. Hear a surprise ending to "Your Grace Is Enough"
Climbing Christian radio charts, "Lord, I Need You" speaks of our reliance upon God's providence. This CD also features three songs in the new Spirit & Song hymnal (fall 2013): the smash hit "Your Grace Is Enough," which closes with the refrain from "Here I Am, Lord," by Dan Schutte; "Adoration," a modern interpretation of the Eucharistic hymn by St. Thomas Aquinas; and "Christ Is Risen," a popular Easter anthem written with Matt Redman. From The End and the Beginning to Overflow and Alive Again, Matt Maher has created an incredible library of music for communal worship and personal devotion. Whether you're looking to share in the unifying experience of one of his events or for songs to inspire your parish, All the People Said Amen demonstrates Matt's gift for leading people in praise of God.